A rant on Random Thoughts on the word Random who would have thought. Today I stopped at a grocery store, who’s name I shall leave unmentioned, to pick up a few things for home. 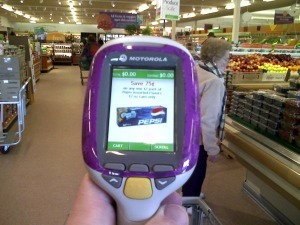 This particular store has a self scanning system that is used in conjunction with their loyalty card. It makes things quick and easy at check out, scan and bag your items while shopping then at the self checker scan a bar code that sends the shopping list to the main computer then scan your card at the register to retrieve your order from the system. Scan your credit or debit card and then your out the door. Well today it was not quite that easy for me at the register. When I scanned my card I got a message that an associate was needed to finish my order. Now this would not upset me usually, but this is the second time this has happened to me, it also happened at my last visit to the store. So when the associate comes up I asked her what this was about and she said that my card was getting a random audit. This is exactly what I was told the last time this happened to me so I made a comment about this not being random. The associate that was taking care of me said that it happens all the time. Well I said that if it happens all the time then it is not random. Her reply was to tell me that a lot of people come in and have their card audited every time that they come in and that is just random. Google defines random as made, done, happening, or chosen without method or conscious decision. Now to me being chosen every time some one comes into a store to be audited means that this is not random but has some other reason for the audit. My real gripe here is not that I am being audited every time I go to a certain store but rather that someone tells me that this is a random occurrence. Please note that CeeLee is to start receiving a random pay increase of two percent on a random weekly schedule. This change it to become effective immediately and will continue until further notice.